On Wednesday the 19th of December, trading on the euro closed slightly down. In European trading, the euro rose to 1.1439. After the FOMC's meeting, the euro fell against the dollar by 75 pips to 1.1364, stopping at the balance line. As expected by the majority of market participants, the interest rate was raised by 25 base points. The Federal fund rate's range is 2.25% - 2.50%. The rate hike was taken into consideration in the prices, as well as the Fed's lowered expectations on the number of rate hikes planned for 2019, which were changed from three to two. 12:00 Eurozone: current account (Oct). 12:30 UK: retail sales (Nov). 16:30 Canada: wholesale sales (Oct). 16:30 US: Philadelphia Fed Manufacturing Survey (Dec), initial jobless claims (Dec 14). The balance line and region around the 67th degree were well supported. During the European session, the price recovered to 1.1425. 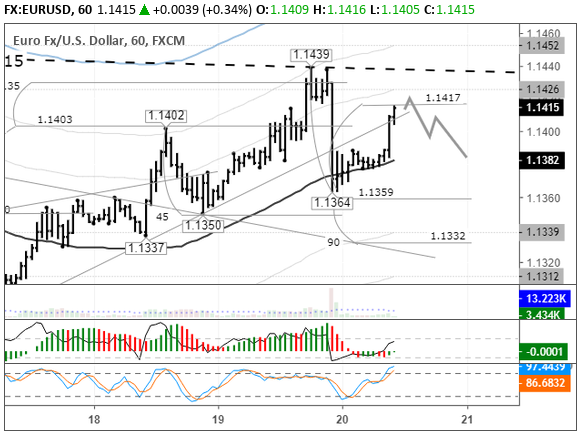 Buyers passed through 45th degree and a setup is visible, pointing to a rise to the resistance of 1.1437. Given the emerging price model, I will assume that a triangular formation will take shape. Before the end of the day I expect the euro to moderately weaken, reaching the balance line at 1.1386. At the moment, based on the current growth, buyers are showing that they are ready to move towards 1.15 and higher. To do this, they need to get close to the resistance where they will remain for around 20 hours.